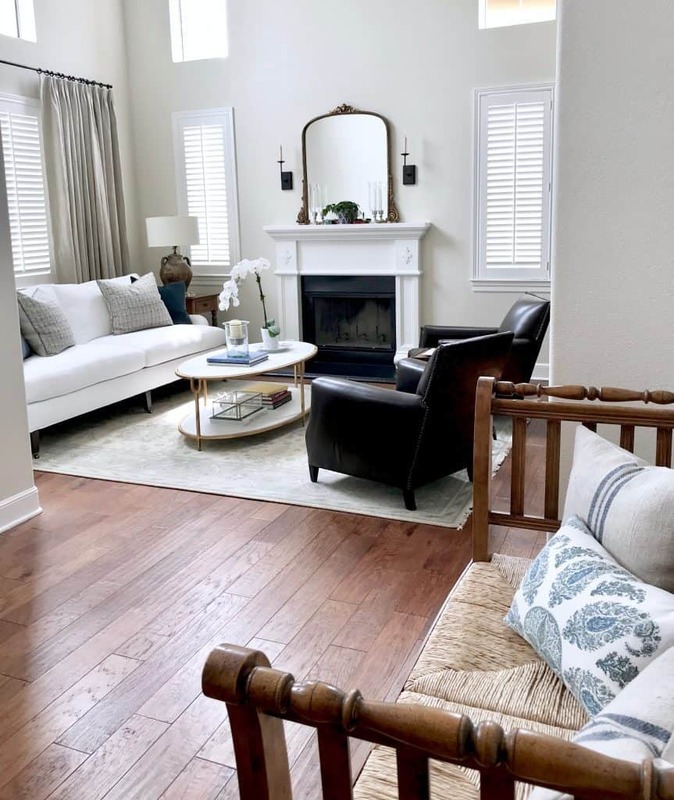 Linda wanted a fresh classic living room that she and her husband would be happy to relax in and proud to have guests over. I’ve said this before but some of my BEST clients are blog readers like you! As a reader, Linda already trusted me when we first met. She had a two-story living room and liked what I did here in Florida. And now… The room really isn’t that large…it just feels that way with the tall ceiling. 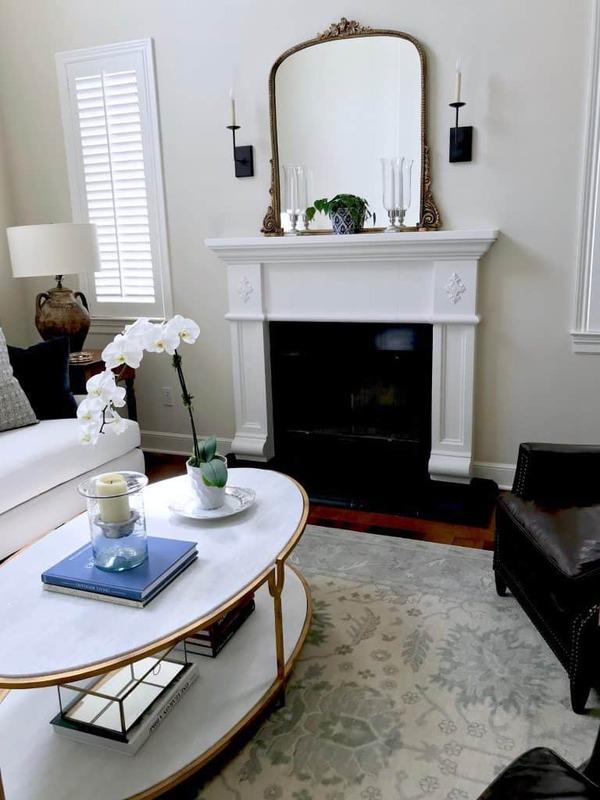 We dressed up the mantel with an Anthropologie mirror (Linda liked the one I have and it was a good shape for here, too) and added Visual Comfort iron sconces in bronze on dimmers (nice at night). 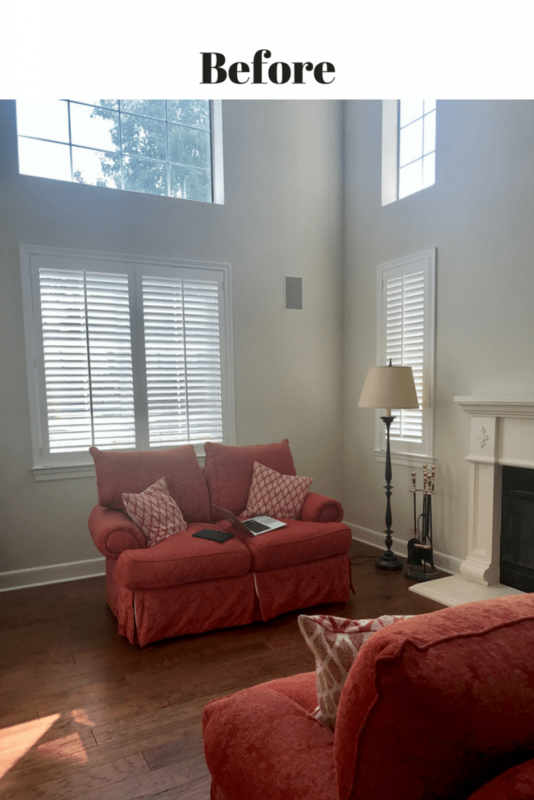 We also installed Restoration Hardware curtains that help “cozy up” the two-story space. 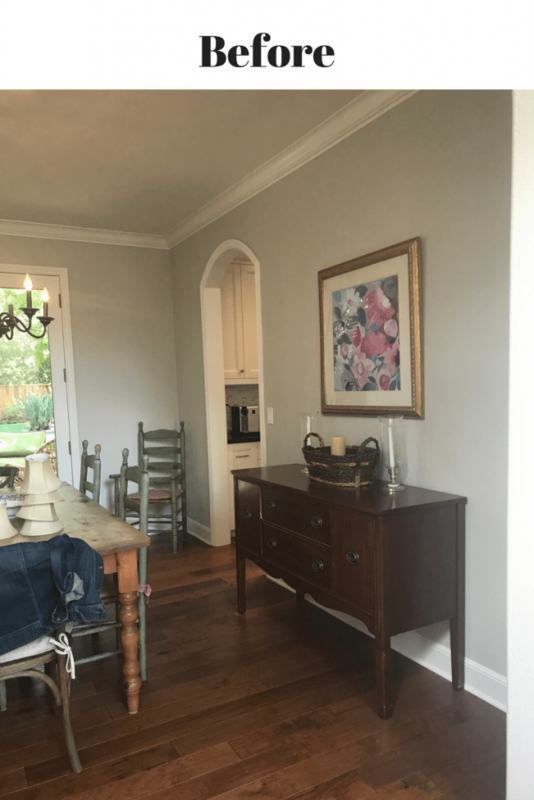 The walls are painted Benjamin Moore White Dove. We changed the fireplace mantel to a brighter white that matches the trim and also painted the hearth a matte black. 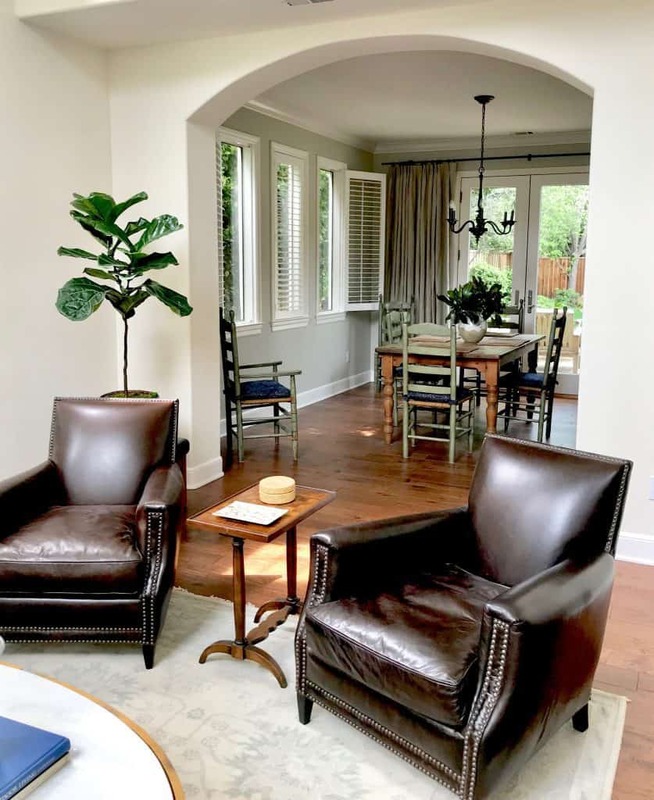 The leather club chairs are from Restoration Hardware (a good size in smaller spaces). There is a Lee Industries classic roll arm sofa covered in worry-free Perennials performance fabric. 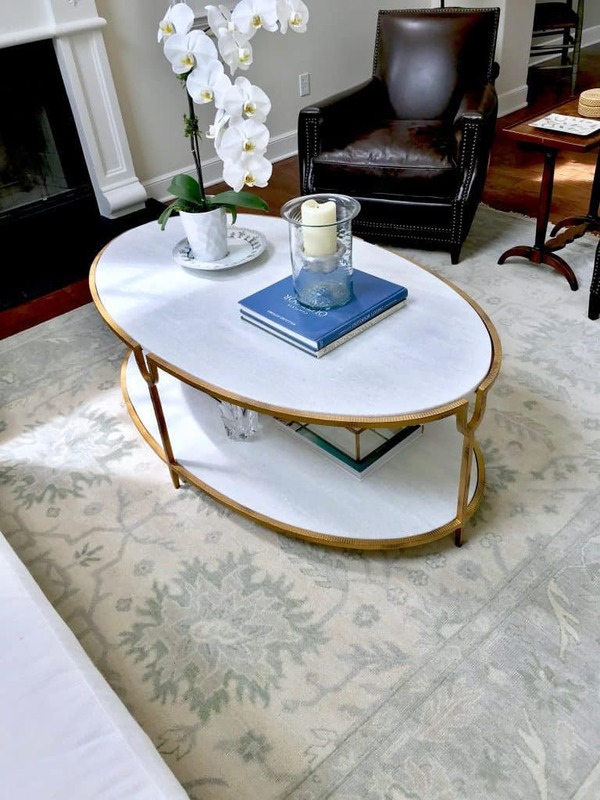 Along with a pretty stone and gilt coffee table from Horchow. 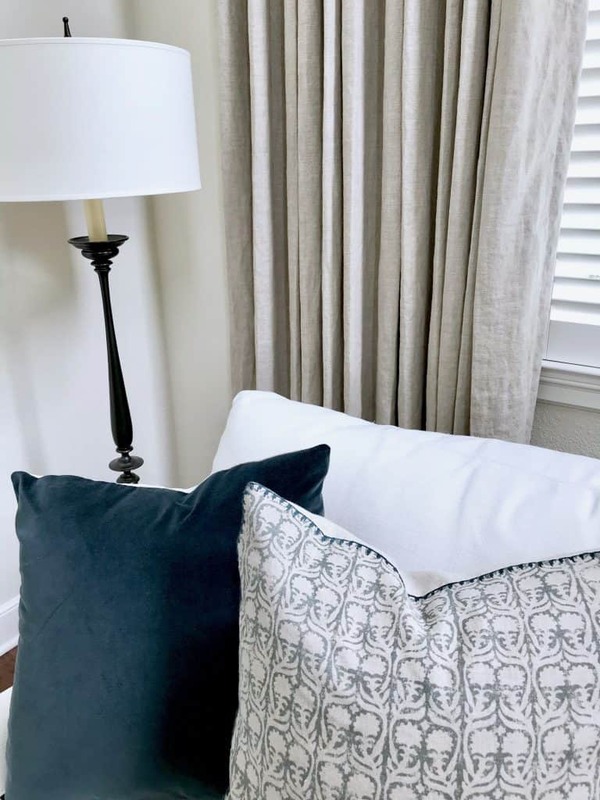 See how the linen and velvet pillows complement the Restoration Hardware sand Belgian linen curtains. We put new drum shades on her existing lamps. Perfect for a fresh, classic living room. 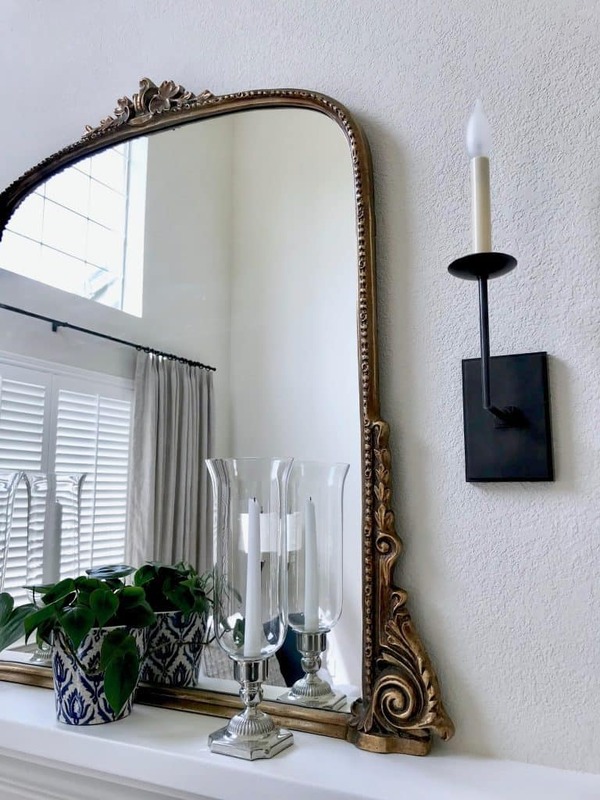 Notice the patina on the mirror and the iron sconce? 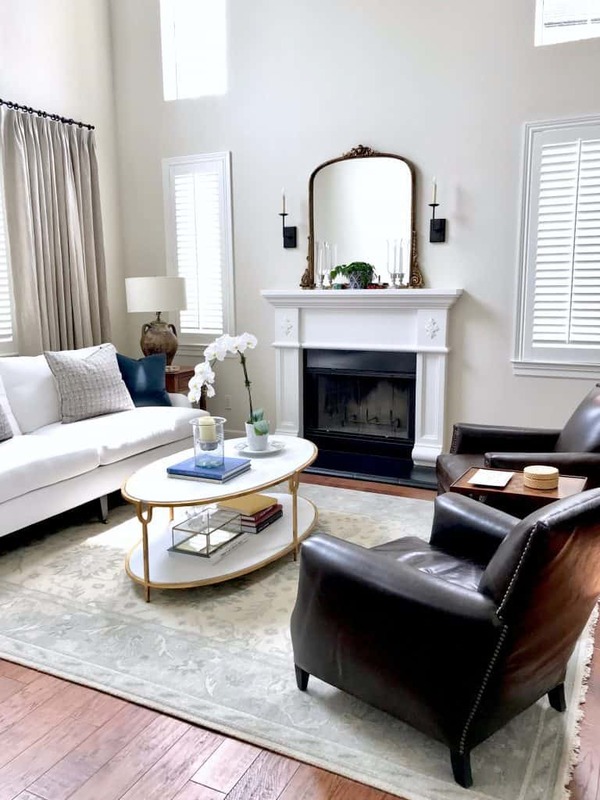 I love the colors in this Ayla rug from Restoration Hardware and the leather club chairs… elements for a fresh classic living room! Ballard iron shelving to display some of their Limoges and family heirloom pewter mugs. had new seat cushions made in a Perennials paisley. We added RH Belgian linen curtains on this side, too. The maple banister was stained a rich color in the foyer before I started working with Linda (good idea). We installed Tuftex carpeting in Taupe. Linda is happy (me too)! Now we are moving on to her family room. I just took measurements yesterday. This fresh classic living room reflects the homeowners much better now. Nice job!!!!! How do you decide on the updated lampshades? I always have a problem with that. They are from RH. Similar to the ones she had before but drum shaped and a little larger. You can always experiment. Love the changes, so well done. Gorgeous. It’s beautiful! 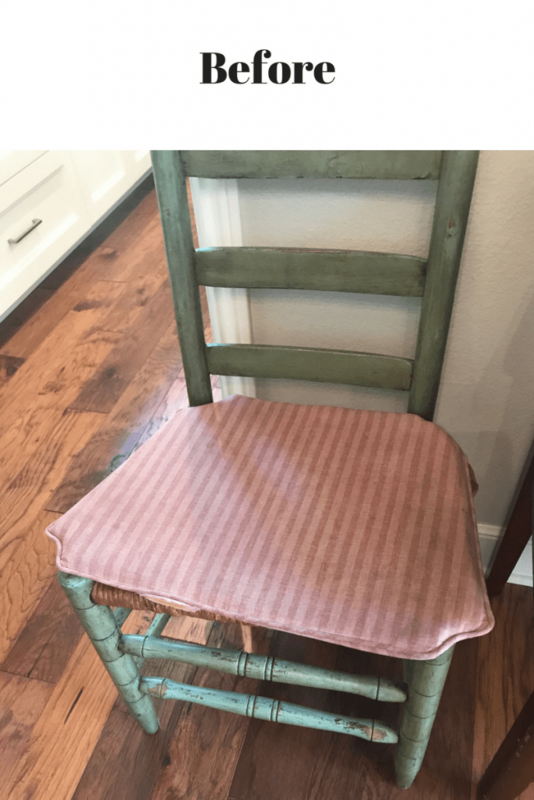 I always enjoy seeing your before & after projects! Thanks, René. I’m so happy when I remember to take before photos. Your changes are both big and small. 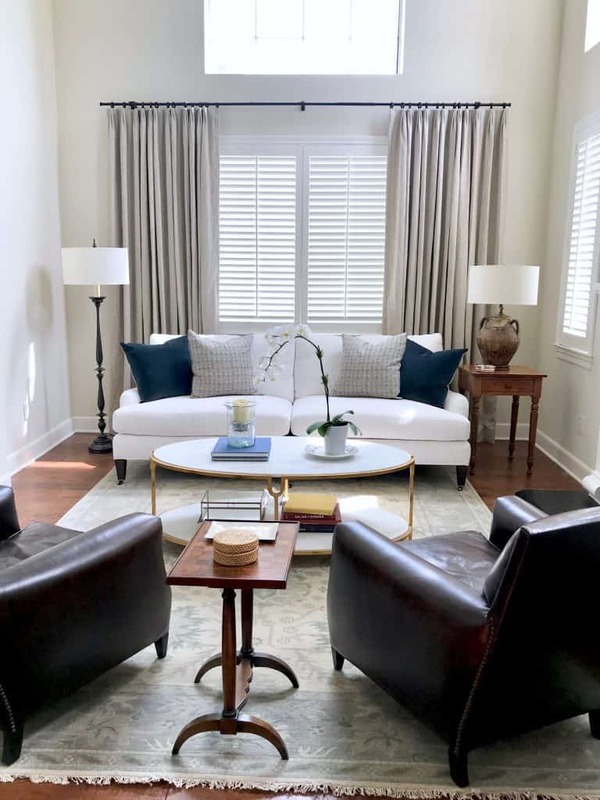 The curtains make the two rooms look dressed–they take away the bare feel. The slightly bigger sofa better fills the wall. Yet, you don’t overload the space with furniture. It still feels airy, even spare. But not bare. Fine line! The chandelier shades are another stroke of genius. I kind of like shades, but, like bangs or no bangs with hair, it all depends. In this case, sans looks better–maybe it’s just the change from before or maybe it’s because it’s less busy. The before sofas were beautiful and I hope they got a new home. I really want to see more color, yet every time I see a neutral room I feel my blood pressure go down. I bet Linda feels the same. Amazing! Feels so inviting. Love the stair carpet and the area rug!! All blends nicely. This is so pretty. I love the changes and can see why the owners are happy too! Beautiful job! I am always so inspired by your makeovers. Love these rooms! Such a clean, fresh, comfortable look. I love what you did! What a difference! The drapes finish the windows nicely and warm the room. I like your choice in sofa and coffee table. 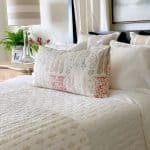 The white in both lightens and brightens the room. Removing the shades from the chandelier made it less busy and more up to date. I bought one similar to that about twelve years ago. Hung it and hated it! The shades always seemed to get cockeyed. Within six months it was down and donated. Ha! I might have been happier with the fixture if I had just removed the shades. Duh! The beautiful mirror brings down the ceiling. Was it Sarah Richardson that talked of creating a water line when decorating a room with a tall ceiling? I had such a living room at the time and heeded her advice. 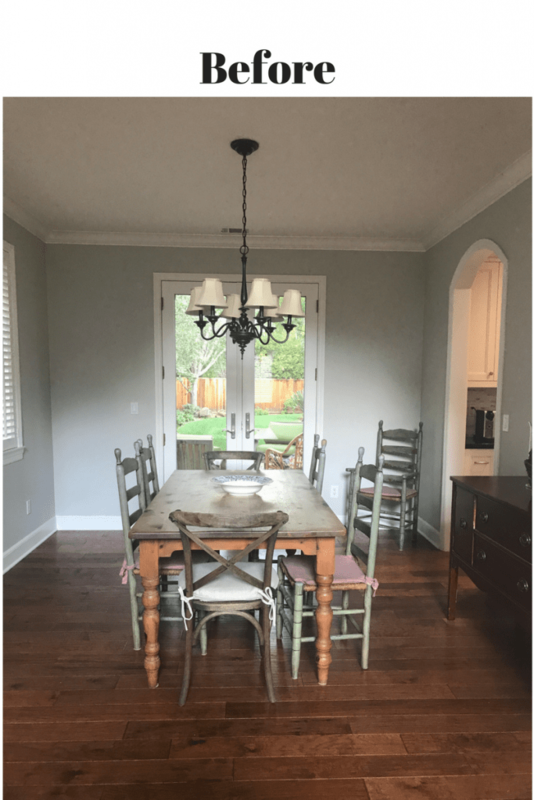 The only other thing I might have done was to white wash the dining chairs to lighten that room, as the white as done in the living room. It would also marry the two rooms. 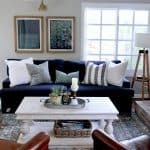 As I read through this post I see how much this interior is so similar to what I have in my home. 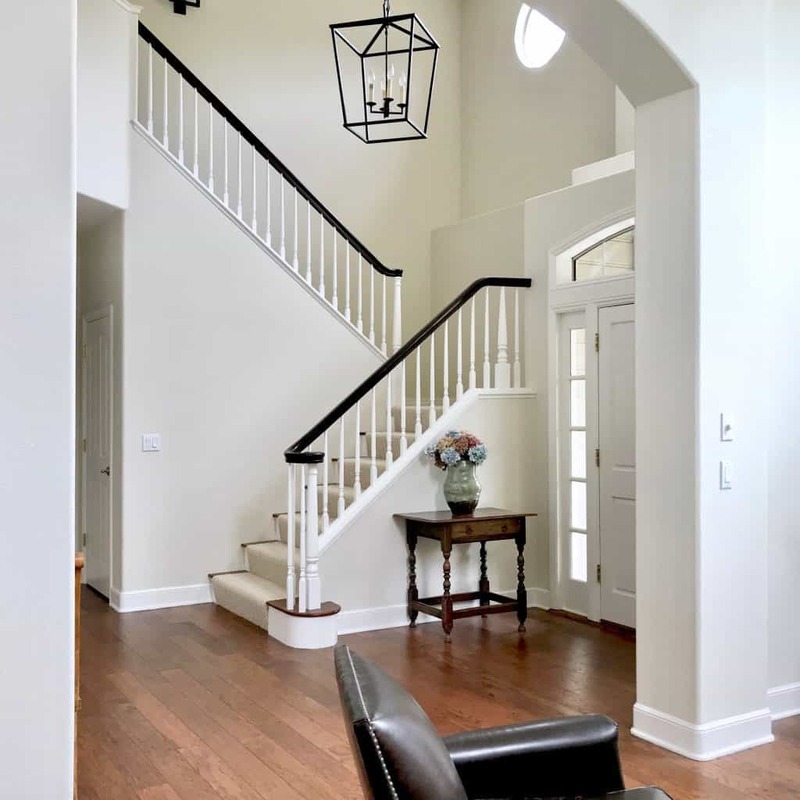 I have a 2 story living room with a dining room attached and a foyer with a staircase that still has the honey oak colored oak banister and staircase. Is there anyway of finding out the general budget range that one can expect to spend on a update of this type? I just don’t know where to start with a budget that is realistic. I’m sorry, Mary, but a client’s project spending is private. You could probably do some calculating based on the sources. My daughter-in-law has that mirror, and I love it. I might be buying one for our new place. The rooms look great! What a huge difference and yet you didn’t change so much at all, It really reflects what a true professional you are, picking out the most important things that will pack a big impact. 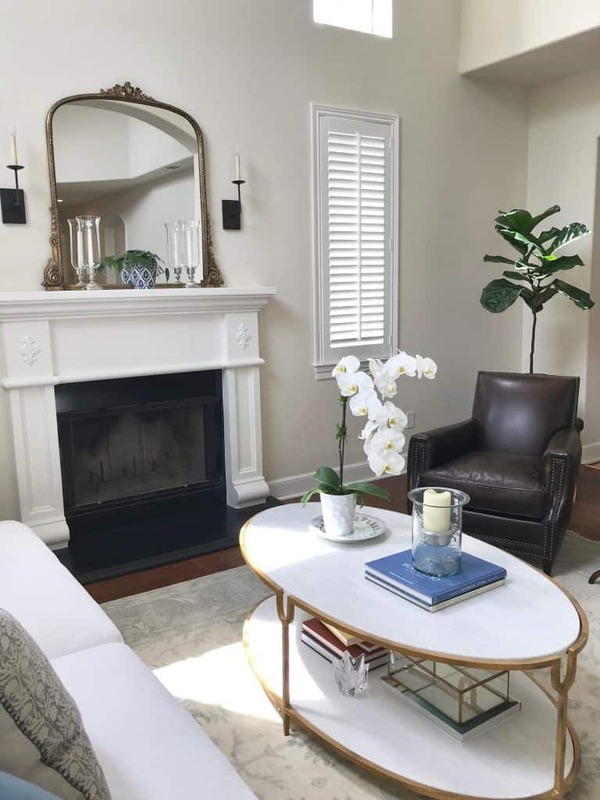 I love the mirror over the fireplace and also the difference in the dining room. So beautifully updated Mary Ann! Wonderful job as usual. I LOVE it. So … beautiful!! This looks great. I have been trying to decide on whites for my walls and trims for almost 2 months now. I started with the idea for White Dove walls and then went round and round to finally decide for sure on the White Dove. I would love a white for trim and cabinets that will make it pop. Am looking at Super White. Do you know what was used here? Thank you. Super white will be great. So lovely, next year my condo living room will get an uplift e design by you! I am going in to remove the shades right now! Removing the dated art was a genius move, the shelves look up to date and polished. 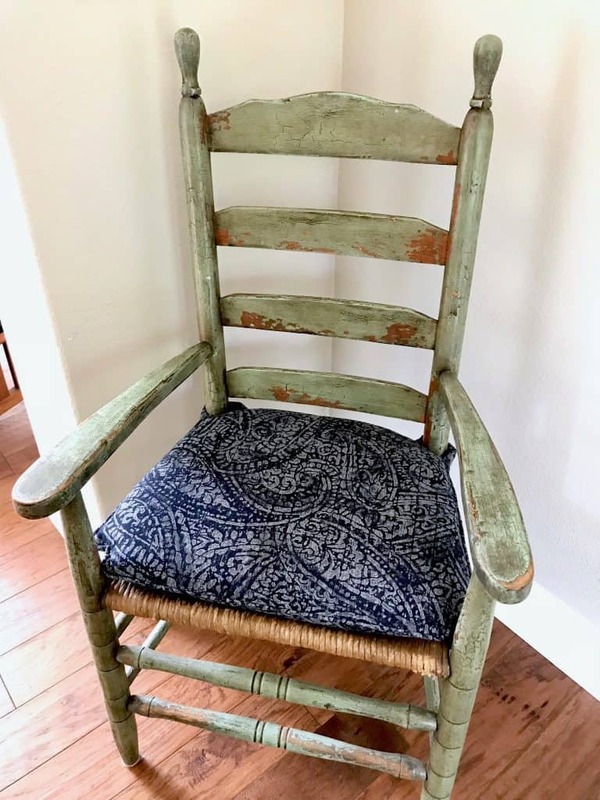 I like the patina on the green chairs, you need history in a room, it would look too new with white washed chairs in my opinion. 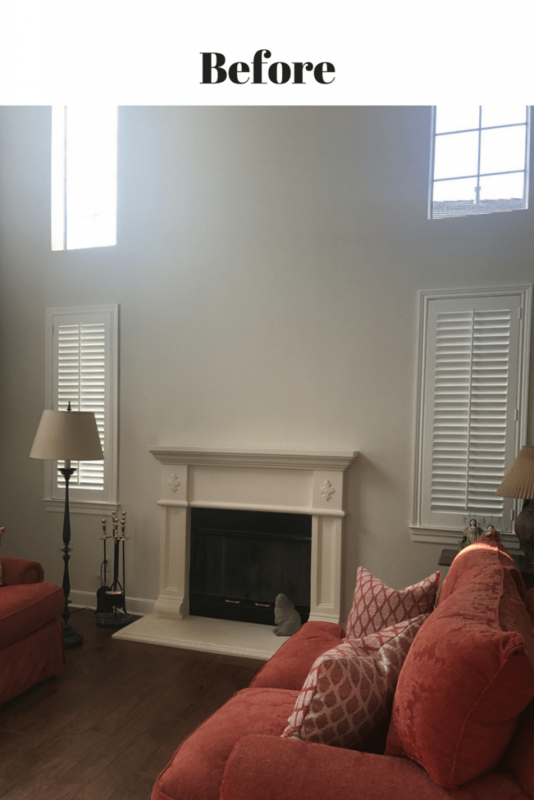 What is your thought process around dressing windows in a two story space? I see that there are no window treatments on the upper windows. Although I have heard that draperies need to go to the ceiling, they often look too skimpy when they are 18-20’ tall. The curtains, in this case, are meant to make the room more human scale. What a beautiful transformation, Mary Ann! It looks so bright, airy and very comfortable. I love the mirror over the mantle, it reminds me of yours, which I’ve always admired. The addition of drapes in the living and dining rooms sure softened the spaces. As always, you’ve waved your magic wand and turned an ugly duckling into a gorgeous swan! 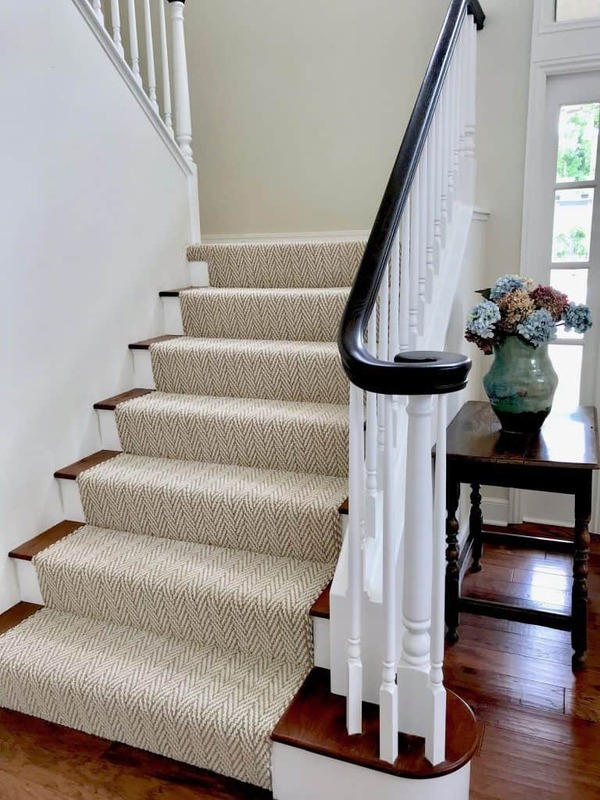 you mentioned (maybe in an instagram post) the homeowner was concerned about putting the runner on the steps because there is wall to wall carpet upstairs. I have the same issue and am wondering how you managed the transition from the runner to the wall to wall carpet. Any chance you’d post a picture of that? Thanks. The changes really made the house seem so much more finished and ‘lived-in’. Good idea…I will take a photo the next time I am at Nancy’s house but basically the stair carpet is carried just up to the top riser. I absolutely love the updated (yet timeless) classic and elegant feel of the spaces!! Beautiful! I love the classic look of both rooms. 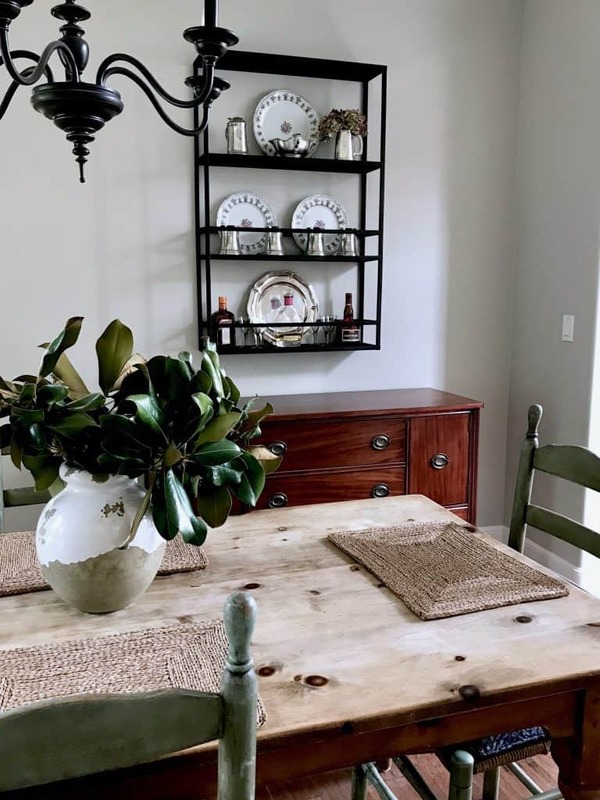 Where did you find the iron shelving in the dining room? It is perfect! 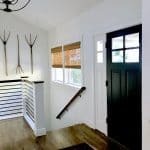 Is the Darlana Lantern in the Foyer a large or a medium? I love everything you’ve done. So beautiful. 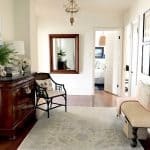 I have a question about the carpeting going up the steps. Is it holding up well for her? We are considering this carpeting for our stairs but taking it all the way up the stairs and into the bedrooms. I’m concerned it may not be comfortable to walk on barefoot. It’s definitely comfortable to walk on!! But I will ask her how its holding up. OK…I must have missed this one! What a transformation this was. 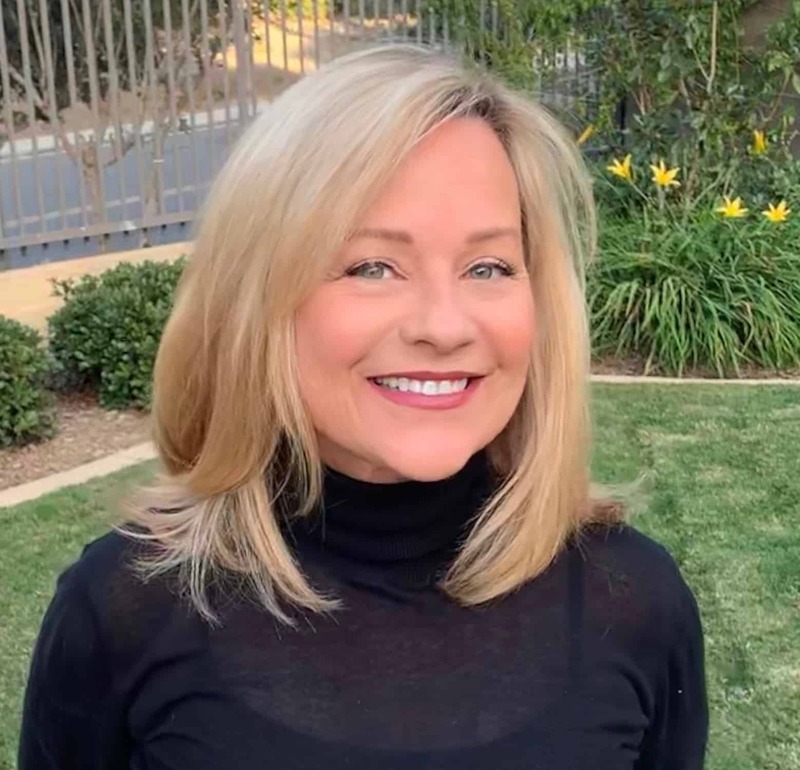 Love every change you made Mary Ann!